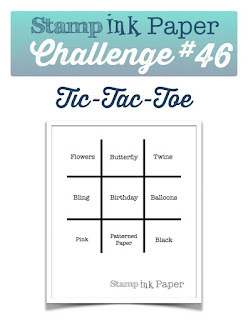 Tina's Crop Shop: SIP #46 Tic-Tac-Toe Challenge! Hello! I hope you've had a wonderful restful weekend and that your week is off to a fabulous start! I got a lot of things done this past weekend which is always a good thing! Since today is Tuesday it is, of course, time for another SIP Challenge! This week it's time for another Tic-Tac-Toe and I went straight down the right hand side and picked Twine, Balloons, and Black. So about 6 months ago I saw an awesome video by the very talented Jennifer McGuire. I have to be honest in that I rarely watch one of her videos that I don't have a list of products to order. LOL This particular video was on the Avery Elle Custom Panel Elle-ments Die Set and she made some fabulous balloon cards by using the curved die. Today's card is my attempt to duplicate, somewhat her process. If you'd like to watch the video, I'm sure you would, just click here! And seriously if you've never watched any of her videos, you've been missing out! For this card, once I decided I'd be using twine and black, it was super easy to figure out my color combination. I have the awesome Mint Macaron and Black Twine from the SU Occasions catalog so I was definitely going to be going with that combination. 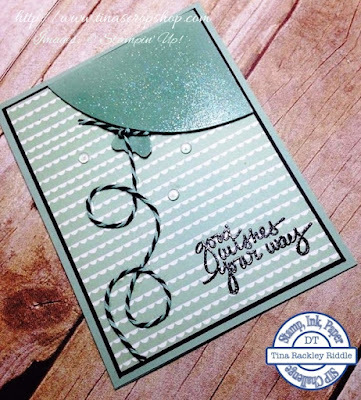 After cutting out the curved piece of Mint Macaron Cardstock and hand cutting the balloon end, I sprayed them both with Glitter Dust Spray Glitter and allowed them to dry before attaching them to the top of my card with Foam Tape. The embossed sentiment on the bottom of the card is from the Lovely Amazing You photopolymer stamp set. I just love the font used on the sentiments in that set! I love this Tina!!! I was wondering, who made the balloon die? And then I looked up the Avery Elle set and thought..ohhhh! I need to watch some vid tutorials and see all you can do with that. It looks pretty awesome. I also like the EP you used, so nice and bold!